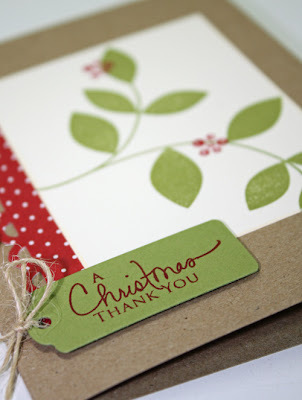 I wanted to make some personal thank you cards for some very special gifts we received this Christmas season. So, I sat down this morning, in my pjs, and "played" until noon! Don't you just love it when there's no schedule??? I went to my kraft paper stash and cut them down to an A2 sized card (4.25 x 5.5"), next I grabbed my SU Very Vanilla paper, a sheet of red Bitty Dots paper from Papertrey Ink and a smidgen of Old Olive SU paper for the tag. I also used my Fiskars Apron Lace border punch and my tag die from Spellbinders. 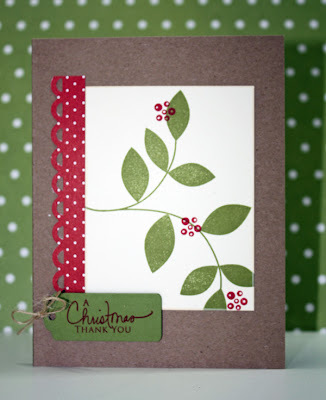 The stamp sets I grabbed were "Signature Christmas" and "Turning a New Leaf" from PTI and one of my absolute favorites, "Berry Christmas" from Stampin' Up. The ink colors I used included, Old Olive and Real Red (SU), along with Vintage Cream (PTI). I also raised the tag up a bit using some dimensionals. I needed to keep it simple and not so bulky because I had several to make. Next, I wanted to share something I bought a week or so ago and it has made a WORLD of difference in my stamping....have you seen these foamy pads (or craft mats as they are called) that are made specifically for rubber stamping? 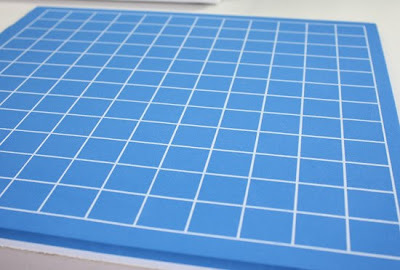 It reminds me of my Bazzill stitching pad, but the size is great for card making or even scrapbooking. I didn't take a picture of the packaging, but mine is made by the Darice company and was a steal for only $5.99 at my local scrapbook store. I tried to get a source for you to check one out on your own, but so far, no luck. Be on the lookout next time you visit your craft store and ask to try one out. My local store had these on their make-n-take table. See you later! Oh my goodness! Those are so beautiful! The recipients are getting a gift from you when they receive one of those.